Jalan Machang Bubok 2, Alma, 14000 Bukit Mertajam. 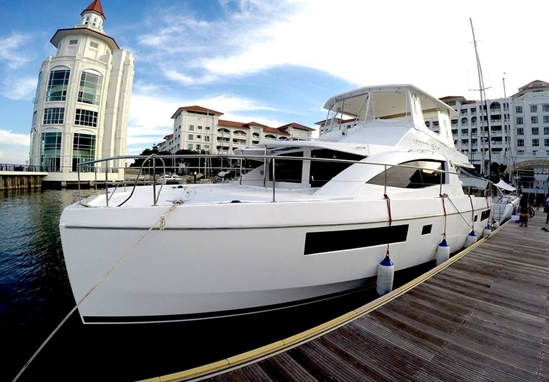 with a private yacht charter in Penang! There are many reasons to charter a yacht for your next event. A Yacht is a unique and exciting venue. At Vangohh Seafarer , we believe our private yacht to be the perfect setting for your next event, be it a wedding, party, corporate event, or product launch. We offer excellence service in our unique fleet of charter yacht. Onboard our yacht, you and your party are our only guests. This allow us to provide highly customized service, as we can focus 100 percent of our attention on making your event unforgettable to you and your guests. Reservation of yacht can be made by way of online booking, telephone booking or walk-in. All reservations will be accepted on a first come first serve basis, upon receipt of the Deposit. The period and fees associated with chartering of our yacht shall be provided in the COA. In order to accept confirmation of reservation, you shall make payment for an advance deposit of fifty (50) percent of the total fees specified in the COA (“the Deposit”). The Deposit is non-refundable. The Deposit shall be forfeited in the event of a no-show i.e. where you and/or your guests do not show up for the scheduled time for chartering of our yacht in accordance with the COA provided to you. Cancellation of reservation is not allowed at any point of time after the issuance the COA unless reasons for cancellation are given and are deem reasonable. The Deposit shall be forfeited in the event of cancellation. Rescheduling of confirmed date for Cruise Charters will be subject to 25% administrative fees on above charter rates. Rescheduling of confirmed date for Cruise Charters lesser than 5 days from the original confirmed date will not be approved. Rescheduling of confirmed date for Cruise Charters is subject to availability. You are able to reschedule it to a later date within a period of 1-week notice subject to availability. You shall be responsible in ensuring that you and your guests do not cause any damage whatsoever to the chartered yacht during the entire period of the charter. You shall be responsible for any damage (if any) caused to the yacht that is attributed to the acts and/or omissions of you and your guests during the entire period of the charter. You agree to indemnify us for all liabilities to the fullest extent permitted by law. Accordingly, you shall not hold us liable for any liabilities, including but not limited to accidents, personal injuries, damages or losses attributed to the acts and/or omissions of you and/or your guests during the period of chartering of our yacht. You shall be responsible to ensure that you have reached the age of majority and have the legal capacity to enter into this contract and execute the relevant transaction for chartering of our yacht. You shall be responsible in ensuring that you have arranged suitable and adequate personal travel insurance to cover the entire period chartering of our yacht. You shall not assign or sub-charter our yacht in the event in our absence of our knowledge and consent. Smoking inside the yacht is strictly prohibited for safety reasons. A designated smoking area on the yacht will be briefed to the Charterer and his/her guests during the visit of charter. Vangohh Seafarer Charters reserves the right to cancel/terminate any cruise in the event of any unforeseen circumstances. In such a case, full deposit amount shall be refunded to the Charterer therein. You hereby agree to indemnify Vangohh Seafarer Charters against all claims, losses or damages resulting from the cancellation.